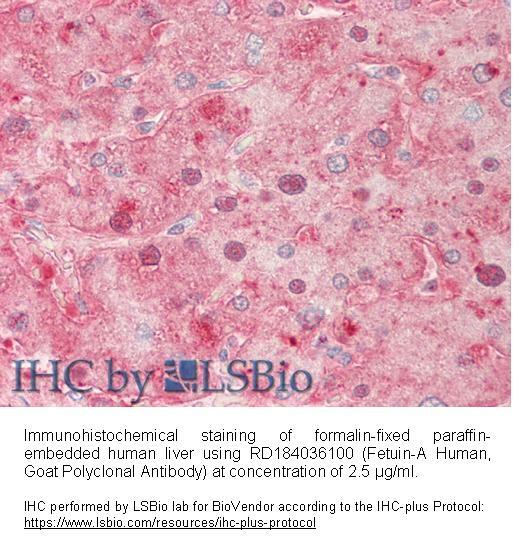 The antibody was raised in goat by immunization with the Human Fetuin. 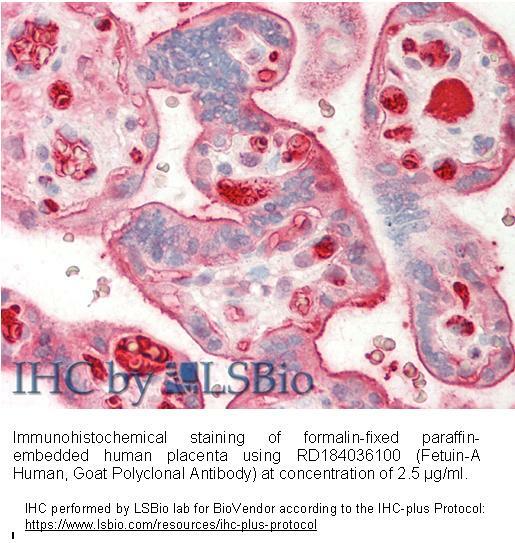 Immunoaffinity chromatography on a column with immobilized purified Human Fetuin. 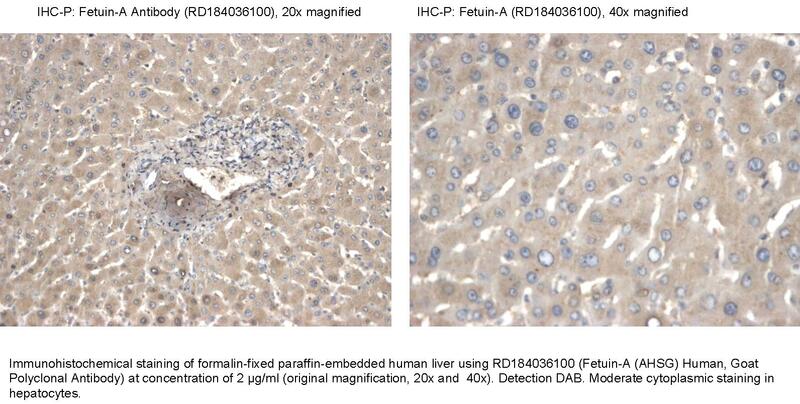 Fetuin-A (AHSG), a 59 kDa glycoprotein, consisting of two cystatin-like domains and a smaller unrelated domain, is predominantly synthesized in liver. It is secreted into the blood stream and deposited as a noncollagenous protein in mineralized bones and teeth. Fetuin-A occurs in high serum concentrations during foetal life, whereas its level declines following infection, inflamatory and malignancy. Fetuin-A acts as an important circulating inhibitor of ectopic calcification, frequent complication of many degenerative diseases. Low serum level of Fetuin-A is associated with vascular and valvular calcification, atherosclerosis, malnutrition and higher cardiovascular mortality in chronic renal failure, liver cancer and liver cirrhosis patients on long-term dialysis. AHSG protein represents a natural inhibitor of tyrosinase kinase activity of the insulin receptor. It may play a significant role in regulating postprandial glucose disposal, insulin sensitivity, weight gain, and fat accumulation. The serum and bone-resident Fetuin-A binds to transforming growth factor-β and blocks TGF-β binding to cell surface receptors. Arnaud P, Kalabay L. Alpha2-HS glycoprotein: a protein in search of a function. Diabetes Metab Res Rev. 2002 Jul-Aug; 18(4): 311-4. Review. Denecke B, Graber S, Schafer C, Heiss A, Woltje M, Jahnen-Dechent W. Tissue distribution and activity testing suggest a similar but not identical function of fetuin-B and fetuin-A. Biochem J. 2003 Nov 15; 376(Pt 1): 135-45. Jersmann HP, Dransfield I, Hart SP. Fetuin/alpha2-HS glycoprotein enhances phagocytosis of apoptotic cells and macropinocytosis by human macrophages. Clin Sci (Lond). 2003 Sep; 105(3): 273-8. Ketteler M, Bongartz P, Westenfeld R, Wildberger JE, Mahnken AH, Bohm R, Metzger T, Wanner C, Jahnen-Dechent W, Floege J. Association of low fetuin-A (AHSG) concentrations in serum with cardiovascular mortality in patients on dialysis: a cross-sectional study. Lancet. 2003 Mar 8; 361(9360): 827-33. Schafer C, Heiss A, Schwarz A, Westenfeld R, Ketteler M, Floege J, Muller-Esterl W, Schinke T, Jahnen-Dechent W. The serum protein alpha 2-Heremans-Schmid glycoprotein/fetuin-A is a systemically acting inhibitor of ectopic calcification. J Clin Invest. 2003 Aug; 112(3): 357-66.